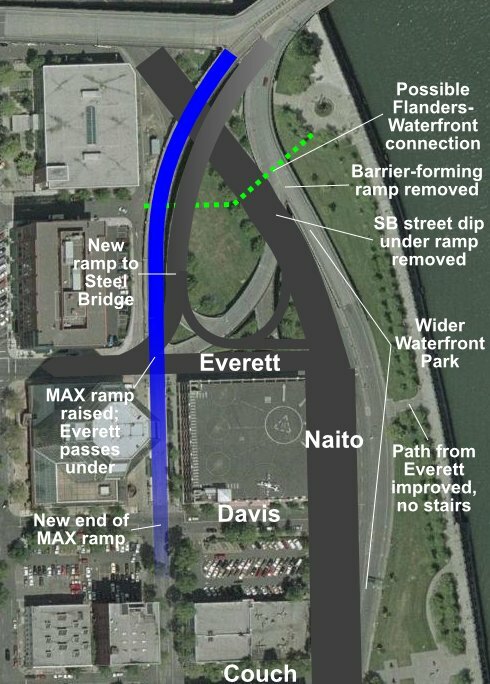 The current ramps would be replaced with one next to the MAX ramp. Traffic from southbound Naito would use a loop ramp that is somewhat like today, but travel clockwise instead of counter-clockwise on it. Traffic from northbound Naito would turn left using the traffic signal at Everett onto a ramp that would merge first with the one from southbound Naito and then into the one from Everett. The Steel Bridge ramp from northbound Naito Pkwy is a barrier and narrows Waterfront Park. This can lead to undesirable behavior in the park and on the Naito east sidewalk next to it. Removing the ramp provides more room for Waterfront Park and removes the barrier. In addition, for more space Naito could be moved over to be next to the buildings on the west side of the street, including possibly under the portion of the parking garage that juts out beyond the normal Naito property line. Northern-most accessible/bike-able connection into/out of Waterfront Park is at Couch Street, through the Japanese American Historical Plaza (at the bottom of the photo). The path from Everett Street has stairs in order to meet the grade of the northbound ramp and is not pleasant, requiring walking between Naito Pkwy & the ramp, and crossing the ramp. Removing the ramp allows the path to/from Everett to be improved and not need stairs. The ramp from Everett Street (& southbound Naito) requires a dip in the southbound Naito roadway to get under it. The re-configuration does not require this. No connection between Flanders (a low-traffic street good for bicycling) and Waterfront Park; those wanting to go to/from the lower deck of the Steel Bridge must travel 6 extra blocks each way. The street dip and barrier-forming ramp hinder one, and it would have to cross the ramp from southbound Naito. The re-configuration would remove those obstacles and the connection would go under the new ramp. In addition, the sidewalk up the new ramp to the upper deck could start from it. Note that while Flanders is one way westbound from 1st to 3rd, there is enough room for a contraflow bike lane or to make it two way. MAX must cross Everett, and trains running in both directions lead to frequent traffic delays. In addition, it has been said that increased delays at Everett & 1st is one of the reasons why a second set of tracks (the Portland Mall project) is needed. MAX would cross over Everett; the end of the ramp would be at Davis. In addition, the rise in Everett street to meet the MAX tracks would be removed.